The basic needs of human sustenance such as food, clothing, shelter and health etc, depends directly or indirectly on farming and associated activities. The economy of a developing country like India is broadly based on agriculture. The farming sector almost contributes 26% of the national production, and 64% of the population in the country depends upon agriculture for their livelihood. India has been primarily named as 'An Agriculture Economy'. There are many countries in the world where farming activities are either undeveloped or underdeveloped. These countries depend upon the imports of Agricultural produce and necessities from farming-dominated countries. From ancient to present or from death to birth has its greater contribution in the human life. The creator, The sustainer, world transformer, The supreme cultivator, The supreme power, God father has inspired us such that the existing problems in contemporary farming can be easily overcome through spirituality and by the practice of Rajyoga Meditation. This will benefit the self as well as society. 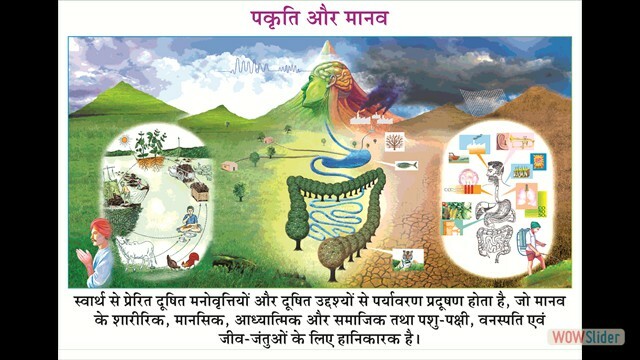 The Everlasting Yogic Farming Project is a new step towards a new era which has been initiated by Almighty's blessings. The Green Revolution has made us self sufficient in terms of Agricultural produce; however, rapid growth of the population makes it necessary to increase food production and safeguard our buffer stocks. Innovative techniques have already been introduced in the Agricultural sector from time to time. In spite of fertile soil, friendly weather conditions and use of intense labor, the farm output is observing diminishing returns. There are many reasons for this, such as inadequate supply of water, interruptions in electricity, ignorance on the part of farmers and unavailability of adequate seeds, biofertilisers, etc. Greater use of chemically treated manures and pesticides has increased the salinity and pollution levels. This has adversely affected the health of mankind. 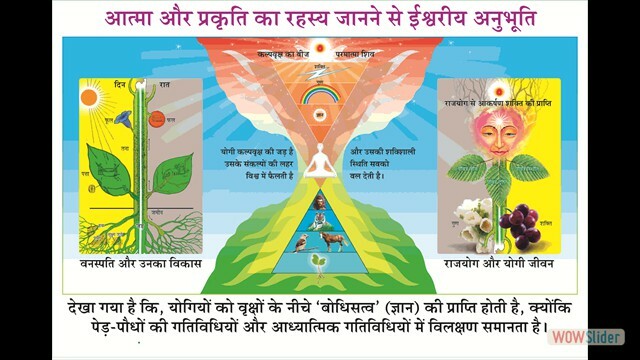 In the current scenario, it is necessary to bring about a revolution in farming methods through spirituality and the experiment of Rajyoga Meditation on the five natural elements. This is a call of the time to bring about moral change in Agricultural methods by introducing organic farming and use of natural compost. In the present time, farmers are increasingly dependent on chemically treated manure to obtain greater output. Some farmers, however, have resorted to organic farming. Drastic changes in farming techniques are being introduced from time to time in Agriculture. Through this project, our attention is drawn towards an underlying truth that the soul in every human being has three inherent powers of mind, intellect and personality traits. These work as the life force of the individual. These powers are directly influenced by the food we eat and conversely these powers also influence our food. Hence, these three powers should be pure and powerful so that we get proper nourishing, tasty and satvic food. Practice of Rajyoga Meditation, inculcation of moral values and spiritual knowledge are necessary to cleanse our mind, intellect and personality traits. Application of inner powers is necessary for producing satvic food and crops along with organic farming. Scientific research has proved that all vegetation is lively and has sensitivity. Vibrations of human beings and sensitivity of nature definitely affect the crops and plants. Agricultural produce too would therefore be deeply influenced by the positively charged vibrations of Rajyoga Meditation to yield nutritious crops in greater margins at a lower cost. Successful experimentation through Rajyoga Meditation has already been proved. Hence this Perpetual Yogic Agriculture Project has been designed with scientific, natural, and spiritual angle. The aim to activate this project in India as well as in the entire world. 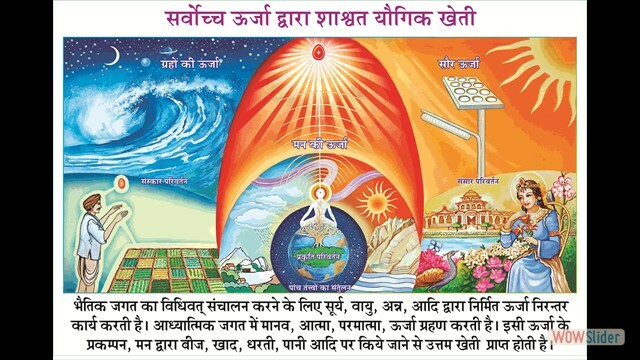 It includes the method experimenting Rajyoga Meditation practice, guidance for transformation through Supreme Power, information of organic manures, natural and scientific devices for crop conservation, creation of a friendly micro environment and ethics of farmers for successful implementation. 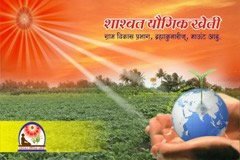 To solve the problems in the agricultural field through innovative methods of agriculture and new scientific experiments, along with use of physical equipment accompanied by spirituality and Rajyoga Meditation. 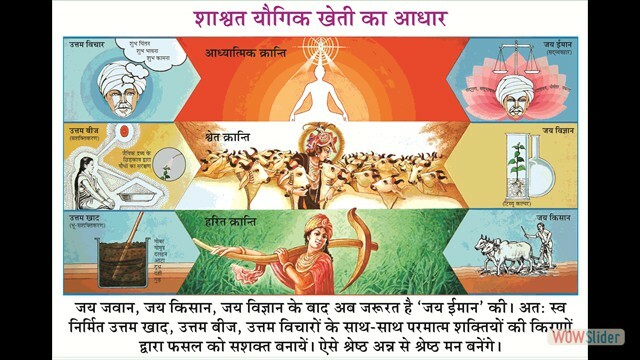 Allround Rural Development along with holistic health would take place through literacy, cleanliness, self dependency, spiritual empowerment and enhancement of moral values in farmers and all those associated with Agriculture. 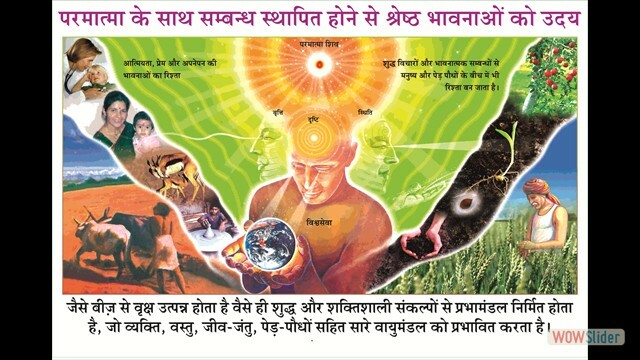 For more production of food grains, the output level of food grains, fruits, flowers, other crops and vegetables use organic manure instead of using fertilizers and pesticides for cultivation and for crop conservation apply natural remedies, friendly micro environment and experiments of Rajyoga Meditation practice. So the output of the crops will be full with living elements, pure and pious. So the human life will be improved and the land will be pollution-free and fertile. Through spiritual powers and Rajyoga experiments divinity will be experienced in family life and social surroundings. Implementation of this project will bring innovation in the field of agriculture and spiritual empowerment in the farmers under which will be a great contribution to create Golden India and Golden Universe. Organizing Various Programmes: The work process of this project will be introduced in India and the foreign countries. Information of this program will be publicised through all aspects of the media. Training programmes will be conducted to create awareness. Agricultural fairs, rallies, seminars, conferences, workshops, exhibitions and camps are included in this project to aid the farmers. Your Contribution For This Project: At the inception of the World Drama cycle, divinity prevailed upon earth. Human beings were replete with divine virtues and spiritual powers. Their food was comprised of satvic, pure and nourished fruits and vegetables, produced through perpetual yogic farming. Thereby the deities were totally immune from diseases and were healthy. They led a prosperous, peaceful and happy life. In accordance with the World Time Cycle, human civilisation is blessed with invaluable guidance of religious founders, sages and great souls. Yet human beings continued to descend to the Rajsic and Tamsic stages and have now reached to their limits lowest. Hence, the Supreme Father, who is the supreme cultivator, has personally incarnated on the earth to re-establish new era. This is an era of the greatest transformation. A revolution is now imminent in the farming sector. We hope you will generously contribute to make the Everlasting Yogic Farming Endeavor -- a new step towards the Golden Era successful, and to carry forward this project to new and greater levels. In June 2009, a Memorandum of Understanding (MoU) was signed between the SD Agricultural University (Gujarat) and the Rural Development Wing in order to conduct research on 'The role of meditation in agriculture with organic inputs on the productivity of various crops'. Inspired by the successful results of this research, scientists and faculty members from Govind Vallabh Pant University of Agriculture and Technology, Pantnagar have also carried out various field studies at individual sites of farmers, who have adopted this Sustainable Yogic Agriculture methodology. Experiments on Yogic Agriculture is also being conducted at Shivaji Agricultural College, Amravati (Maharastra) and Water and Land Management Institute (WALMI), Aurangabad (Maharastra). • Improved percentage of seed germination • Healthier root modulation, enhanced soil microbiological activity • Higher oil content in groundnuts • Drop in damage by pests (much lower compared to organic farming) • Increase in nutritional values • Increase in energy levels and the shelf life of vegetables • Appreciable appearance and improvement in taste of vegetables As the initial positive results and benefits began to be noticed by other farmers, neighbours and the community in general, the practice spread and many farmers all over India are practicing Sustainable Yogic Agriculture techniques. Over the last two years, Italy, Greece and South Africa are amongst some of countries, where these techniques are being experimented with. A progressive farmer Mr. Balasaheb owns 11 acres of farm land in Ichalkaranji, Maharastra. Originally he was using fertilisers and chemicals on it, as he was convinced that it was not possible to grow a crop without them. Then he had an inspiration from the local Brahma Kumaris centre! With the support of that local centre, he started Sustainable Yogic Agriculture in half an acre. Using conventional methods, the yield he used to achieve was 45MT of sugarcane in one acre land and the current yield through yogic agriculture is 65MT. He also witnesses improvement in the quality of the yields. Consequent to the benefits reaped using yogic agriculture, he went on enhancing the area of cultivation under this method and currently uses this method on all of the 11 acres of his land. Following his example, now 250 other farmers have joined him to bring about positive impact on their crops and the yields.